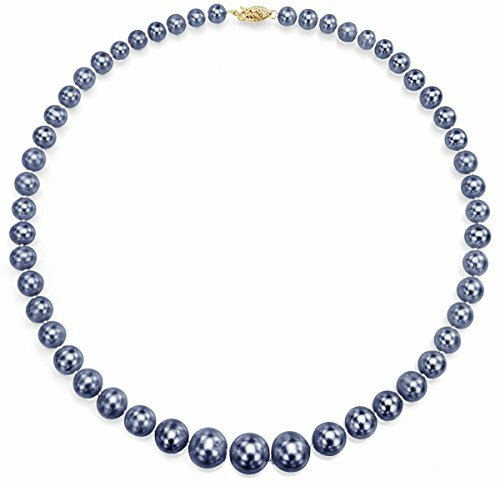 A Classic 18K Yellow Gold Graduated 6-11mm Freshwater Cultured High Luster Pearl Necklace 18" Length. We Carry Different Colors of Pearl. Please Contact Us if You Do Not See What You Need. DIRECTLY from THE SOURCE - These beautiful freshwater pearls are imported directly from the pearl farms. Each pearl is meticulously hand-selected and inspected. 18K GOLD: Our pearl necklaces are finished with a fishhook clasp crafted of Yellow Gold to delay oxidation and prevent tarnishing. HYPOALLERGENIC JEWELRY: Our Pearl Necklace collection does not contain irritating metals. Perfect for sensitive skin. Lead free and Nickel free. THE PEARL EXPERTS - La Regis Jewelry helped create the standards for today's pearls. Each order includes a Certificate of Authenticity that guarantees the source and quality of the pearl.